Jerry Mander is founder and distinguished fellow of the International Forum on Globalization, and was called “patriarch of the anti-globalization movement” by the New York Times. His early career was as president of a commercial ad agency, and then later, non-profit political advertising with Public Media Center, which concentrated on environmental and anti-war work. His previous books include Four Arguments for the Elimination of Television (1978), In the Absence of the Sacred (1991), The Case Against the Global Economy (1996), and Alternatives to Economic Globalization (2002). 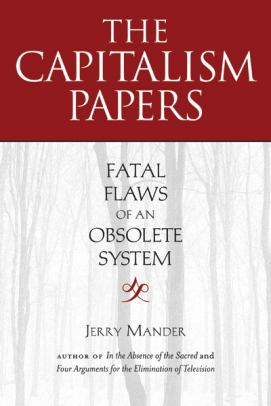 This article is reprinted from Chapter 10 of his new book, The Capitalism Papers: Fatal Flaws of an Obsolete System (Copyright © 2012 by Jerry Mander). Is advertising legal? Most people agree that it is an uninvited intrusion into our lives and our minds, an invasion of privacy. But the fact that we can be aware of this without being furious, and that we do little to change the situation, is a good measure of our level of submission. There is a power relationship in advertising that is rarely, if ever, looked at, and yet it is a profoundly corrupt one. Some speak; others listen. A. J. Liebling famously said, “Freedom of the press is guaranteed, but only if you own one.” Freedom of speech is also guaranteed. But only if you have a few million dollars for an effective media strategy. Soapbox oratory doesn’t sway the public anymore. But the powers of advertising go well beyond the amount of money spent. The true power is in the nature of moving-image media, projected for hours every day into human brains. It’s a form of intrusion we have never before in history had to face. Even now in the Internet age, the powers of television and advertising are undiminished and insufficiently examined or discussed. Very early in my advertising career, it became clear to me that I was being paid to stop you from doing or thinking whatever else you might want to do or think, and instead get you to focus on the piece of information that was of interest to my client. All advertising is an attempt by one party to dominate the other. More than $150 billion is now spent annually in advertising in this country—$450 billion in the world. Every dollar of that has the same purpose: to get people to do what the advertiser wants. Very few people have a similar opportunity tospeak back through media, to make demands on the advertisers. Or to suggest some other way to find happiness besides buying things. This makes it a very one-sided deal. Advertisers say that you have the choice of not buying their products, as though that’s satisfactory. You get to say yes or no, like voting a one-party ballot. And you get to say it thousands of times per day. Advertising is now literally everywhere, interrupting our lives at every turn, requiring that we deal with it. We walk through life as a kind of moving target; hawked at by media, hawked at by signs on the street —blinking, flowing, five stories high. Even clothes have ads on them, and we wear them proudly. Corporations have become like “community” for us. Steve Jobs was our guru. We mourn him as we once mourned Martin Luther King. What a transition. The situation has advanced to a capitalist utopia: a giant, nonstop global marketplace that carries itself into all our experiences. Life has become a process of constantly avoiding things that people are trying to sell us. Yet most people don’t complain. Why do we tolerate this? What right do advertisers have to treat us this way? When did we sell the rights to run pictures in our brains? If the airwaves are public, then why are they filled with people selling things all day without our permission? In fact, the “public airwaves” are supposed to be a “public commons.” We own them. In the early radio days, you and a few friends could throw up an antenna behind the house and speak to the world. It was like the early Internet days—YouTube, radio-style. That stopped when the broadcast frequencies got crowded and capitalists realized what a crucial instrument this could become. The FCC fell quickly in line with the corporations during the 1920s and started selling off our public rights to the airwaves, granting licenses to commercial interests who could pay. Over the years it made little rules about “fairness and balance” and “equal time,” but those rules and rights were soon overpowered and, under Ronald Reagan and then Bill Clinton (who helped launch the infamous Telecommunications Act of 1996), effectively eliminated. The “public airwaves” are now nearly totally privatized. Even the remnants of public airwaves, like PBS and NPR, now have commercials. When the PBS NewsHour reports some horror story about Chevron’s behavior in the Amazon, it feels obliged to say, “Chevron, a ‘sponsor’ of the NewsHour, was today accused of….” I turn off the program the minute I hear that. The fact that advertising can be occasionally entertaining does not mitigate matters. You could also enjoy a visit from Jehovah’s Witnesses, or from an entertaining vacuum cleaner salesman who came ringing the doorbell five times daily. But you would do that only if you had nothing else to do. Your public airwave commons have been invaded, as has your mental space. If that is not a constitutional invasion of privacy, then what is? In 1975, I convened a small meeting in my living room in San Francisco, which included some of the leading public interest attorneys in the Bay Area, to ask them if they thought advertising was legal. The way I read the First Amendment, I said, was that its intention was clearly to promote democracy by assuring that all people have equal rights to free speech —at least a fair amount of equality in opportunities for expression —and a similar ability to access all other points of view. When the Bill of Rights was written, in the late 1700s, there were no national broadcast networks that could project one political point of view to millions of people. There was no advertising, either, except for the occasional handbill, to project a particular vision to those same millions of people. If the goal of the First Amendment was to sustain a democratic flow of information, those days are long gone. The commercial broadcast media speaks to everyone all day and night, and we don’t get to speak back. And those media outlets are owned by a tiny group of megacorporations. As for advertising, it’s a medium that, by definition, is confined only to the people who can afford to pay for it. The First Amendment wasn’t conceived to give powerful advertising conglomerates power over the people. The advertisers speak their imagery, and we absorb it. Shouldn’t that qualify as a violation of the Constitution? Isn’t that illegal? The group in my living room thought maybe it was, or ought to be, but, given the way the Supreme Court was ruling in those days, they decided there was not yet much opportunity there. Since then, things have only gotten much worse, especially since the Supreme Court’s passage of Citizens United. Capitalism can exist without advertising, of course, and did so for its early years. The spice traders of East India and the railroads laid across the American continent during the 1800s did not need much in the way of advertising to promote their offerings. The benefits were obvious and clearly understood —and word got around. The offerings themselves were relatively scarce at the time, so their availability was itself news. When capitalist enterprises provide products and services that everyone needs and wants, advertising is not necessary. You don’t need to advertise food: basic grains, vegetables, fruits, meats. Everyone wants and needs a certain supply of those and will search them out and buy them wherever they might be available. However, no one has an intrinsic need for packaged frozen lasagna, Coca-Cola, Cheetos, or Burger King. Those have to be advertised, promoted, and packaged in appealing ways. No one needs to advertise fresh water, but you do need to advertise Perrier. You don’t need to advertise clothing —people know they need clothing —but Macy’s needs to advertise; so do the Gap, Walmart, and Christian Dior. Nor is there any need to advertise transport services; anyone needing to get from here to there will make the effort to find out how. But you certainly do need to advertise a new Ford Fiesta in some artful way, or a Cadillac, to justify the expenditure. And once you have successfully sold that one, you may need to persuade a buyer to upgrade to the latest model. Meanwhile, the wider system needs to persuade the broad public that it is selling a way of life that equates with happiness and fulfillment. The dominant delivery system for mass advertising in our society even in the age of the Internet, is television. As with all other commercial media in capitalist societies, the specific assignment of television is to attract as large an audience as possible and to fixate that audience for as long as possible every day. Television has exceeded all expectations on that score. The average American watches more than four and a half hours per day, all year, every year. Most important for the corporate world is that television and its programming have proven to be the best possible packaging for their real product: the advertising. If certain programs do not attract advertisers, they will soon be off the air. Television commercials have characteristics that are especially useful for instilling desire and commitment in a mass population to buy things that it could mostly get along without. American culture and the entire global economy have been built around these unnecessary exchanges. More important, it is built around the constant expansion of these exchanges for as long as possible, or at least until they combine to reach a level of near saturation —a global bubble of commodity production and consumption that, if it falls off by a percentage point or two, which it recently did, is catastrophic. Advertising first asserted its prominence in the early twentieth century through radio, then exploded into its heyday in the 1950s and ‘60s, when television took hold. It was in that post-Second World War period when America and the world were desperate for some means to avoid crashing back into the Depression. It was a matter of economic survival that our economy should expand at a rate sufficient to make use of its surplus industrial capacity, as well as a huge labor surplus that existed after the war. Factories that had formerly made armaments were now empty. They needed to be converted to producing consumer goods, to be hyped and sold. Speaking in the language of moving images, television offered capitalism its greatest opportunity ever to accelerate consumer consciousness. Over the last half century, the combination of television and astronomical advertising spending has effectively reshaped the consciousness of the United States and the entire planet: our self-image, the way we aspire to live, our habits, our thoughts, our references, desires, memories. Total U.S. advertising spending, which was only $2 billion in 1940, grew to $12 billion by 1960, then $54 billion in 1980. By 2010, even while recovering from the recession, the U.S. advertising industry was still spending well above $150 billion, with by far the largest percentage of that going to television, says Adweek. This represented more than one-third of total global advertising spending, which by 2010 reached $450 billion. Despite competition from the Internet, as well as from magazines, radio, and newspapers, television today remains by far the largest and fastest-growing ad medium in the world, increasing by more than 9 percent in 2010, says eMarketer (March 29, 2011), more than double the total of online advertising. Meanwhile, the U.S. Bureau of Economic Analysis indicates that the U.S. (GDP) showed corresponding growth, from $100 billion in 1940 to $525 billion in 1960, to nearly $3 trillion in 1980, to $14 trillion in 2007. According to the Nielsen Company, the primary assessor of most of these matters, 99 percent of American homes have television sets and 95 percent of the population watches at least some television every day. Two-thirds of U.S. homes have three or more sets, arranged for separate, private viewing. The average home has a TV playing for about seven hours per day, even when no one is watching. While the average adult watches about five hours per day, the average child aged two to eleven watches nearly four hours per day. The average adult over age sixty-five watches about seven hours per day. Sixty-six percent of Americans typically watch television while eating dinner. Thirty-five percent of local TV news broadcast time is devoted to advertising. (The percentage devoted to crime and disaster is 53.8.) These figures have varied over the last couple of decades, but not by much. The average television viewer watching television for four-plus hours per day is hit with about twenty-five thousand commercials per year, and by age sixty-five, that number exceeds two million. That would be twenty-five thousand annual repetitions of basically the same message: You will be happier if you buy something. Ours is the first generation in history to have essentially moved its consciousness inside media, to have increasingly replaced direct contact with other people, other communities, other sources of knowledge, and the natural world —which is anyway getting harder and harder to find —with simulated, re-created, or edited versions of events and experiences. Some people argue that the situation has improved now that we have cell phones, computers, iPads, Twitter, and other social media. A Pew Research Center study found that most American teenagers send fifty or more text messages per day, and one-third send more than one hundred per day. All of this non-TV technology is good, they say, because information gathering and exchange have become far less passive than TV, and more intellectually engaging. Our minds are more “alive.” But the advent of computers and the Internet, for all their interactive features, has not diminished the total amount of time that people watch television. What the Internet has achieved is only to add to the time that people with access to computers spend physically and mentally attached to information machines as their sources of imagery and ideas. The science fiction image of the disembodied brain seems ever more appropriate. In the United States, aside from time spent sleeping and working, television viewing is still the main thing people do with their days. It’s replaced community life, family life, culture. In many ways, television has become the culture, and by this, I do not mean so-called “popular culture,” which sounds somehow democratic. Television is not democratic. Viewers at home do not make television; they receive it. Television does not express culture; it expresses corporateculture. A lot of advertising is aimed at children aged eight to thirteen. One relatively new category of ad expenditures is directed toward children younger than eight years old. Psychologists Tim Kasser and Allen Kanner, co-authors of Psychology and Consumer Culture, have reported that advertising targeted at small children now represents $12 billion-plus per year in the United States, with $95 million of that coming from just Burger King and Quaker Oats’ Cap’n Crunch cereal. Tens of millions more dollars go into psychological research on what gets kids to push their parents into certain buying decisions. A report by Paul Nyhan in the Seattle Post-Intelligencer (May 7, 2007) described a University of Washington study called “Babies and TV,” finding that even “babies are glued to television sets these days, with 40% of 3 month olds and 90% of 2 year olds regularly watching TV.” The Kaiser Family Foundation in 2003 reported that 65 percent of children over eight years old have a TV in their bedroom, and confirmed that not even infants are free of television. About 20 percent of U.S. parents leave a TV on next to their baby’s crib all night. It certainly has some kind of hypnotic effect, keeping the infants quieter. Of course, many researchers have established this hypnotic effect as functioning to some degree in all age groups among heavy viewers. Studies also show that small children, far from being quieted by TV, seem quieter only when watching; turn off the TV, and they revert to hyperactive behavior caused by the heavy viewing. According to a famous study from the 1960s by the Australian National University, it works like this: kids watch the screen and see some lively or dangerous activities; they have the instinct to respond, but it’s television, so they repress the response. After a while there is a build-up of go-no-go energy, then the set goes off, and splat they’re all over the place (and we have a problem). In the late 1970s, during the presidency of Jimmy Carter, the Federal Trade Commission, under Michael Pertschuk, was so shocked at the mounting revelations about industry practices in relation to small children, it decided to hold public hearings to establish any negative effects of ads directed at kids under six years old. There was particular alarm about techniques that urged children to bug their parents to buy them unhealthy sugary cereals, for example. But before the first FTC hearing could even take place, a unified uproar arose in the media—from the right and the left, even including the New York Times, to its shame and disgrace—denouncing and editorializing against the whole effort. The Times said it would inhibit the free-speech rights of advertisers. President Jimmy Carter, a liberal, gave in to the concentrated media pressure, canceled the FTC hearings, and fired Mike Pertschuk and his assistant, Tracy Westen, who was the man in charge of the children’s advertising project for the FTC. Westen went on to a distinguished teaching career at UCLA. No one has since attempted to revive such hearings aimed at protecting children. It’s a primary drive of corporate globalization that every place on Earth should become like every other place on Earth. This creates new investment opportunity for global capital and promotes efficiency in resource management, production planning, marketing, and distribution for millions of commodities and their producers. But the external homogenization process also requires an internal homogenization process —a remake of human beings themselves —our minds, our ideas, our values. The ultimate goal is a global monoculture of human beings that fits nicely with the redesigned external landscape, like so many compatible computers. In the end, corporations seek a mental landscape that nicely matches the physical landscape of freeways, suburbs, franchises, high-rises, clear-cuts, and the sped-up physical life of the commodified world. Internationally, the situation is little different from the United States. About 80 percent of the global population has access to television, with most industrialized countries reporting viewing habits very similar to those in the United States. In Canada, England, France, Germany, Italy, Russia, Greece, Poland, and many other countries in Europe and South America, the average household watches 3 to 4.5 hours per day. According to the OECD Communications Outlook (2011), the comparable “household TV viewing time” in the United States is 8.35 hours, more than double that of most OECD countries. In any case, in many parts of the world, the TV that people watch often comes from the United States and from other countries in the West; local programs are few. Even in places on Earth where there are no roads —tiny tropical islands, icy tundras of the North, log cabins —millions of people are sitting night after night, watching urbanites in Los Angeles or Miami or New York driving sleek cars, standing around swimming pools, or drinking martinis while plotting ways to do each other in. Life in the States is made to seem the ultimate achievement, while local culture in other places, no matter how vibrant and alive, is made to seem somehow backward, less fun, not good. Merging with TV values is quickly replacing other ways of life. People everywhere carry identical images and crave the same commodities, from cars to hairsprays to Barbie dolls to iPhones. TV is turning everyone into everyone else. It is effectively cloning cultures to be alike. In Brave New World, Aldous Huxley envisioned a global cloning process taking place via drugs and genetic engineering. We have those too, but TV does just as well, because of the medium’s reach and power, and because of the intentions of its owners. It’s not only the volume of television viewing that matters, but also the nature of the experience and the powers of the imagery that we ingest daily. It was a half century ago, in 1963, that I first entered the world of commercial advertising. Only then did I personally grasp the nature and power of moving-image media. I realized it’s possible to create and project purposeful images into millions of brains at the same time, and to get people to view and believe things in the way you wanted them to. I loved that —at least, at first. It was lively and fun and brought a sense of omnipotence. Advertising people don’t talk about it much, but as a group they generally accept that if they had sufficient funds, they would have the ability to enter and redesign human consciousness according to commercial intention, and that the whole process of injecting imagery has transformative capabilities. And since it can also change worldviews, the process should ultimately be understood as potentially deeply political, with great powers of persuasion and influence, concerning not only products but also political philosophies and choices. Neil Postman was right in Amusing Ourselves to Death: “Advertising is the most important subject we don’t discuss and that we do nothing about.” This is especially so now that advertising has taken on such a huge role in political campaigning and the information movement. Most people, especially if they are well educated, still believe that advertising (or television, for that matter) has no effect on them or on their beliefs. Their intelligence protects them against invasive imposed imagery, even when an image is repeated a hundred times in their heads. People believe in their immunity even though the imagery does not actually communicate through the language of logic or contemplation. Images ride a freeway into your brain and remain there permanently. No thought is involved. Every advertiser knows this. As a viewer, you may sometimes say, “I don’t believe this,” but the image remains anyway. My late partner in the advertising business, Howard Gossage, spoke frequently to audiences about “the dirty little secret” among advertisers: that their silly superficial meaningless trivial imagery nonetheless goes into your brain and doesn’t come back out. “It doesn’t matter how observant or intelligent you are,” he said. If you are watching television, you will absorb the images. Once the image is embedded, it is permanently embedded. You cannot get rid of it. “If you don’t think so,” said Gossage, “how come if I say ‘Jolly Green Giant’ most people will instantly get a picture in their heads of this huge green character wearing green leotards, selling peas?” Of course you do. Well, actually, maybe you don’t. Gossage was speaking in the 1960s. But contemporary examples abound: How about images of a giant gecko? Did you think of Geico insurance? How about the Taco Bell chihuahua? Or Ronald McDonald? Or the Energizer Bunny? Or that M&M candy that doesn’t want to be wrapped around a pretzel? Did you know you were carrying all these images around in your head? The effects of this stream of invading images apply as much to noncommercial images as they do to commercial—Donald Trump? Glenn Beck? Dominique Strauss-Kahn? Sarah Palin? Oh God, get those people out of my head. Television imagery rides into your brain as a vast potpourri of mixed image forms that is otherwise not experienced anywhere in life. Dozens of categories of information are strung together as though they were all in the same domain of reality. Because of that, the viewer is disadvantaged, trying to sort out or discern what is “real” and what is not. It’s one reason why the instrument produces such a high degree of passivity among viewers. After a while, the best choice is to give up, sit back, and just let it come. In a normal couple of hours of television viewing, you are likely to see a combination of fictional images from drama or comedy shows, as well as scripted reenactments of historical events; reality shows that show real people doing things they would be unlikely to do without cameras pointed at them; news programs, which are supposed to be real but cover events that happened an hour or days or weeks ago, and that are edited and cut down from many hours to fifteen to twenty seconds, with a commentary to tell you how to understand them. This river of mixed-up imagery is further interrupted every few minutes by advertisements that sometimes have well-known real people in them —actors or celebrities —who are paid to tell you things they otherwise would not and probably don’t believe. Or else it’s cartoons, or dancing words, and loud music flashing in and out, and fast cuts to mountains or beaches or deserts, then nightclubs, then battlefields. And then it’s all suddenly interrupted by the next commercial and the next; then back to the “real” news or reality show or fictional police show. Next, you might see an image of a couple walking on a hillside, a quarter of a mile away, though you can hear their words as if they were next to you —and then, the music rises. All of this variety of imagery and sound comes through the same image stream, largely undistinguished, and becomes the weird DNA of moving-image media. How are you supposed to keep up with all that, making distinctions on each point, thinking it over? You cannot keep asking yourself, “Is this real?” “Do I believe this?” Anyway, the images are real, at least in the sense that they are physically composed of the pixels on the TV screens, but the content of the images breaks down into dozens of categories. If you did ask yourself questions intended to sort things out, you couldn’t keep up with what’s happening on the screen. You wouldn’t keep watching at all. So instead, most of it enters as one flowing ephemeral stream of “reality.” It’s captivating. Literally. Once you see it, you can’t un-see it. The only way to avoid it is to stop watching. Of course, repetition also has an important role. Each time you see a replay of a commercial—that you may wind up seeing hundreds of times —it has the cumulative effect of adding vitality to the stored image, especially if it’s well executed. While that may not make you go out and buy the product or vote for the candidate, advertisers are just playing a numbers game across a wide audience. The more people who see it, and the more times they see it, the more likely they are to react. Repetition adds “heat” to the image. The viewer becomes more familiar with it. It gradually becomes part of him or her. In the long run, across a wide public, it makes the advertiser’s desired outcome more likely. If this weren’t true, why would they continue spending hundreds of millions of dollars doing it? Here’s the point: your intellect cannot save you. You don’t really want that imagery, but you’ve got it anyway. The imagery enters your brain, whether it’s advertising imagery or general programming. Once in, it’s impossible to erase. It becomes a kind of internal billboard, ready to flash at appropriate moments. You may not believe everything Glenn Beck had to say, but he continues to say it inside your head. You are not in control. There’s a second point: information transmitted in this way, in the absence of counterpoint imagery and argument, especially when repeated over and over, takes on an undeserved element of authority—“seeing is believing.” And whoever controls that technology has powers that no one before ever did. Hitler controlled a nation largely through the power of his amplified voice broadcast on the radio night after night. It would have been even easier with television. Most commercial advertisements are pure imagery. That is, they don’t try to make factual arguments. This is especially true during the most expensive prime-time hours, which the biggest national advertisers use. Soft-drink ads tend to display a lot of very attractive people laughing and smiling or playing volleyball while drinking Coke. Insurance commercials may show darling children or families that need protection. Even auto ads, which we would expect to have something concrete to say, are far more focused on glamorous curves, or speed, or good-looking people. Very little is said about anything you might consciously agree with or disagree with, using a logical perspective. It is pure form, image, and mood. This is an important point. In the 1960s, there was a burgeoning “reform” movement focused on advertising that demanded counter-advertising when commercial messages were false. The problem with that effort, however, was that most advertising does not dwell in the realm of truth or fiction; most ads don’t say anything that you can agree or disagree with. Not even ads for hard technological products —cars, washing machines, computers —promote their wares on the basis of their superior technology, life span, or reliability. Mostly it is for their timeliness or style. The exception to the rule is usually found only on late-night low-budget television where, say, a car dealer will announce the unbelievably low price of a new car, which by noon the next day turns out not to be anywhere on the lot. That, you could identify as false advertising and attempt to legislate. But it’s a very minor part of the advertising industry. Most advertising, especially in expensive prime time, doesn’t make claims about product performance. It’s all innuendos, associations, and images. The cute couple is happily drinking Pepsi on their first date. The pug dog is breaking down the door to get his Doritos. The problem with commercial advertising is not whether the ads are truthful or not; the problem is the image itself. Once it is ingested, it becomes our frame of reference. Over time, we begin to imitate the image. We see the mannerisms from the TV show Friends turning up among our own friends. We slowly begin to merge with the imagery. Like the Novice who contemplates the Buddha for decades, hoping to absorb his nature, we absorb the advertising. We become what we see. And we share its values. On the other hand, the problem with political ads, especially campaign ads, whether Republican or Democrat, is that they are almost always lies. We are left to base our votes on false information. If there is any domain of public speech that ought to demand laws requiring absolute truth, it is political expression. But the opposite seems to be the case. Some people predict that the 2012 presidential campaign will see over $1 billion being spent on advertising, by each side. Political ads are typically wildly overstated and frequently make things up. At the very least, all points are magnified or distorted. Always, they leave out relevant facts that might weaken their arguments. The total imagery we receive from those distorted ad expenditures totally overpowers most impressions we get from “live” debates, for example, or press conferences, where we see the candidate through less of a filter. You may remember the patently false “swift boat” TV spots against Senator John Kerry when he ran for president against George W. Bush in 2004. The ads sought to destroy Kerry’s record of military valor, claiming that he never deserved the major medals for combat bravery that he won in Vietnam, and that he was soft on defense. In one powerful ad, the images showed military equipment suddenly vanishing from a battle landscape, leaving our soldiers undefended. This was to show what would happen to our unprotected troops under a Kerry presidency. Meanwhile, other ads showed George Bush as a tough, clear-minded, military leader. The swift-boat ads seemed so silly that the Kerry camp did not at first respond. By the time Kerry did respond—weeks later—it was too late. His public ratings had collapsed. Kerry had forgotten the cardinal rule of political advertising: in the absence of a counter-ad, people will always believe whatever images they see. How could it be otherwise? In the absence of an alternative set of images, the public will always accept the apparent “evidence” of imagery. All advertisers know this. They know that even the dumbest products and ideas can gain acceptance because advertising imagery does not appeal to intellect but exploits a human, genetic, sensory predisposition to believe what we see. That’s the way premodern humans protected themselves. In that sense, we are all still premodern. A follow-up story in USA Today interviewed voters in seventeen swing states who had seen the false ads. The story revealed that the public accepted the patently false ads as true. Interviewees mimicked exactly the language from the advertising. Here’s another advertising homily that Kerry didn’t know: logic will never overcome imagery. Press conferences were useless. The images were in, and they had not been answered soon enough. In a New Yorker article, “State for Sale” (October 10, 2011), Jane Mayer described the way ultra-wealthy North Carolina oligarch Art Pope used his enormous wealth to finance advertising campaigns against Democratic candidates for North Carolina state office. It is a model for ultra-conservatives in many states, who have begun to use a particular kind of advertising to throw out Democratic candidates. In many cases, Pope’s funding for North Carolina Republican candidates totally overwhelmed opposition candidates, who had never faced that kind of financial infusion. But it was not only the amounts of the financing, but also the messages, that were so unique. They were very often based on totally misleading innuendos that were hard to counter. More ads of a similar kind followed. By the time Dickson fought back, it was useless. She had been dramatically outspent and victimized by negative imagery. She lost the election, as did other Democratic candidates who were similarly attacked. There are no laws about misleading innuendos or false statements in political campaigns, and no legal avenues available to respond. Is this a good way for democracy to run its electoral processes? Some countries —most of Scandinavia, for example —ban all paid advertising in election campaigns and provide candidates an equal amount of free television exposure. It would be nearly impossible to implement such a system in the United States, where the television industry depends on the income and has the lobbying power to demand it. Most of our lives are contained within physically reconstructed, human-created environments—cities, buildings, streets—where nature is no longer visible. It’s as if we have moved inside the minds of the people who imagined these constructs and realities. In this way, generation to generation, we go more deeply into human thought and creation: mediated reality. Now that our direct contact with the sources of reality are highly diminished, our sources of usable information are parents, friends, schools, offices, and media —print, electronic, radio, television, and the Internet. The final result is that we cannot any longer have personal certainty that the information we get is entirely reliable. All mediated information is processed, edited, and altered in various ways as described above. TV commentators tell us what to make of it all. We make guesses about who is best to believe. Rachel Maddow? Sean Hannity? Limbaugh? Colbert? There is also “science,” of course, which makes wider observations about natural forms and interactions and tells us what to think of it all. But we can’t know the reliability of that, either, since scientific certainty varies from year to year. It tends to be wrong at least as much as it’s right. Mammograms are necessary every year to stop cancer. Annual mammograms cause cancer. Prostate screening stops cancer. Prostrate screening is unnecessary and causes other awful conditions. Coffee is bad for you; coffee is good for you. Now we find that a lot of Einstein’s theories about the universe are wrong. If Einstein is wrong, who isn’t? Finally, we make our own judgments. We guess. It sounds either right or wrong. We believe one side of the science debate or the other. With most of our information mediated —that is, processed and edited and changed by human beings who have specific purposes for the image —and without any direct contact with the true circumstances of an issue, how can anyone possibly know what is right and what is wrong? And yet we are asked to make our country’s major decisions based on the knowledge we receive from the machine. So, it’s Murdoch or Eisner, or Shell Oil and GM, or Democratic media consultants, or Republican media consultants, who enter our brains, leave their viewpoints, and firmly implant their images. Then they each spend millions of dollars’ worth of political ads, most of which are wildly distorted. We can only guess what to finally believe. I once tried to prove the point that we cannot separate truth from fiction when the information is brought to us solely through media. In my book In the Absence of the Sacred, I tried a little experiment on the reader. Early in the book, I described an event of some significance, which was designed to help make my case in a certain discussion. But then later in the book, I reported to the reader that what I had indicated earlier was made up. I was simply demonstrating that readers have no way of knowing whether information in media, even books, is true or false. They pretty much take it all on faith. This came as a real shock to some readers, who hadn’t thought about this possibility before. In fact, right now, I might be lying to you again. I just told you I did an experiment in a book of mine, but maybe I didn’t do that. How could you possibly know if it happened or didn’t, without direct knowledge? Certainly, you could read that book and find out the truth, but in most media you cannot double-check. All mediated information is wrapped in doubt, especially moving-image media. We tend to always believe the image, because images seem real. But they’re not. The images we see in moving-image media are redesigned, rearranged, edited, sped up, slowed down, reorganized, sometimes reenacted; dialogues are changed, music applied. If we base our democracy on such processes that are intrinsically unreliable and infinitely alterable, always approximations, can we expect effective public participation and engagement? Making matters worse, these processes are controlled by a very small number of people, whose total intention is to get us to behave and think in ways that will expand their wealth. These people are capitalists. The single-most-alarming fact about global communications today—given the immensity of its reach, power, and effect —is how few global corporations control it. The concentration of global media ownership rivals that of the global oil industry. But the difference between oil and media is that the former deals with tangible things, while the latter deals with consciousness. As such, it may be even a more central factor shaping how societies evolve and whether democracy functions right now. One amazing expression of this power and control, though little noticed at the time, was the way the telecommunications industry gathered its forces in the 1990s and forced the eventual passage by Congress of the landmark Telecommunications Act of 1996. It was a tour de force that merged three dominant trends of our society: the grand promise of great new technology, the powerful capitalist drive for nonstop profit, and the already-advancing capitalist takeover of government and media. The law was passed after tens of millions of dollars were paid by industry lobbyists to compliant members of Congress, and with practically no public debate. It mandated that by the end of 2006 (later stalled to 2009), the entire country would junk our “ancient” analog TV sets. Less than a decade later, we would all be required to buy new, digital TV sets or substitute auxiliary equipment, enabling the complete instant national conversion to a new technology that, really, nobody needed. The financial benefits to the corporate-tech community were stratospheric: instant obsolescence for a technology in every American home; new (forced) equipment purchases by an entire population; a tremendous economic stimulus for the economy (particularly technology companies); an instant congressional payback to campaign donors; and an effective subsidy to corporate executives and stockholders. (It also greatly benefited the shipping industry, which got to collect and lug those obsolete analog TV sets to ever-more-expansive waste-disposal fields in Africa and India.) What a vast, thoughtful undertaking, involving direct costs to every household in the country, with no public debate (or lawsuits) about the government mandate to buy, and doubtful benefit to consumers! But the Telecommunications Act was not even primarily about selling more hardware. President Bill Clinton had promised that the act would also advance the democratizing of media ownership. But, after staggering levels of industry lobbying, it proved to have exactly the opposite effect. In radio, for example, it lifted ownership limits beyond the previous standard and made possible a new level of concentration. One company, Clear Channel, now owns at least 850 radio stations. In cable TV, five companies —News Corporation, General Electric, Disney, CBS/Viacom, and AOL Time Warner —would soon own twenty-four of the top twenty-five cable channels in the United States. Together, they account for 85 percent of prime-time viewing, and 74 percent of programming expenditures, according to “The Case Against Media Consolidation: Evidence on Concentration, Localism and Diversity,” edited by Mark N. Cooper, of the Donald McGannon Communication Research Center at Fordham University, 2007. Meanwhile, only twelve companies gained control of 61 percent of U.S. movie theaters, according to the National Association of Theatre Owners (2009). Giant media companies began to own two or more distinct sectors, such as film production, recorded music, radio, newspapers, book publishing, cable TV, and broadcasting, globally. According to Ben Bagdikian in Media Monopoly, by the end of the twentieth century, ownership within the whole media sphere was heavily dominated by eight companies: Time Warner, Disney, Viacom, Seagram, News Corporation, Sony, Bertelsmann, and General Electric (which owns NBC and TCI, among dozens of others). Also rising very quickly is Vivendi Universal. Warner Brothers films and TV, CNN, TNT, TBS, Court TV, HBO, Comedy Central, Hanna-Barbera, Cartoon Network, Cinemax, New Line Films. Control of 22 percent of the one hundred largest cable TV markets. Magazines include: TIME, Fortune, People, and Sports Illustrated. Warner Music Group (one of five companies that dominate global music markets), 90 percent ownership of Time Warner Telecom, 37 percent of Road Runner Internet service, 40 percent of Towani (Japanese movie/TV producer), 23 percent of Atari, 31 percent of U.S. satellite TV company Primestar. It also owns the Atlanta Hawks and Atlanta Braves, as well as major shares in movie theater companies, distributorships, and satellite and cable companies, not only in the United States but also in the U.K., Asia, the European Union, Africa, and elsewhere. Disneyland, Disney World, Euro Disney, Disney Channel, ABC TV, ABC Radio, ESPN, ESPN NEWS, ESPN International, A&E, Entertainment and History channels. They own Miramax, Touchstone, and Walt Disney Pictures, as well as 660 Disney stores, Club Disney, Disney Cruise Line, the Anaheim Angels, and the Anaheim Mighty Ducks. Disney also owns 20–33 percent of such Euromedia companies in other countries as Eurosport TV network, the Spanish Tesauro SA, the German terrestrial channel RTL2, the German cable TV channel TM3, the Brazilian TVA (pay TV), and Patagonia Film (Argentina). Fox TV Network, Fox News Channel, 20th Century Fox Film Studios, Golf TV channel, twenty-two U.S. TV stations, 130 daily newspapers (including the Wall Street Journal, the New York Post, and the London Times), twenty-three magazines, HarperCollins publisher, and the L.A. Dodgers. It has large interests in satellite companies like United Video Satellite Group and Echostar, and large interests in British Sky Broadcasting, British Interactive, Sky TV, and Latin American TV channels including El Canal Fox, Fox Sport, and Latin Sky Broadcasting. Fox owns majority shares in Munich TV station TM-3; Vox TV Network; Italian pay-TV venture Stream; Fox TV Channel, Netherlands; New Zealand Natural History Unit; Asian Star TV satellite; dozens of broadcast channels in India, China, Japan, New Zealand, Australia, Taiwan, and Indonesia; and 52 percent of New Zealand’s newspaper circulation, among many dozens of others. Nobody in any democratic society voted to put a few advertisers in charge of all these media. Nonetheless, this handful of giant corporations, all representing roughly identical worldviews, get to speak and project their information and imagery into our brains night after night, all year, using the public airwaves. For decades, large media conglomerates have also been pressuring the FCC in the United States to permit a much higher degree of cross-ownership among forms of media. They argue that companies should be free to own newspapers, radio, and TV in the same markets. Finally, under George W. Bush in 2007, the Federal Communications Commission loosened the restrictions on a thirty-five-year-old ban on newspaper-broadcast cross-ownership in single markets. If this ruling remains operative, it allows for any company that can afford it to buy and operate both a major newspaper and a radio and/or TV station(s) in the same market. The FCC move was immediately challenged by public interest advocates, including the Prometheus Radio Project and Media Alliance, and is now plodding through the courts. It will doubtless eventually reach the same great U.S. Supreme Court justices who gave us the Citizens United decision. My prediction is that before long, the world’s largest media companies, which may already own TV stations in a given market, will, for the first time, also be allowed to own the local newspaper and at least one or two radio stations, thus capturing an entire information environment. In effect, Rupert Murdoch already nearly does this in the New York City area, with his ownership of the New York Post, the Wall Street Journal, and the Fox News network. Fortunately, in that market there is also strong liberal opposition in all media. But in most places there is not. We could wage a counteroffensive at the level of content…. But this approach is like using napkins to clean up an oil spill. It fails to confront the true danger of advertising—which is not in its individual messages but in the damage done to our mental ecology by the sheer volume of its flood…. To say that advertising is metaphorically mental pollution is one thing. To say that advertising is literally a kind of pollution and that TV commercials and highway billboards are more closely related to toxic sludge than to speech, is another matter entirely. The commercial media are to the mental environment what factories are to the physical environment. One cannot be an environmentalist without also being a mental environmentalist. Seen in this light, the fight against advertising is the defining struggle of our era. Info-diversity is as critical to our long-term survival as biodiversity. Both are bedrocks of human existence. Over the years, there have been a variety of consumer movements and government efforts to counter the control of advertisers over media and its content. There was the old Fairness Doctrine, which established, for a time, that if erroneous information regarding public health were presented in advertising, then consumer groups could apply to run free counteradvertising, but only up to one-seventh of the insertion rate of the original. There was also the “equal time rule,” which tried to be responsive to false statements in political advertising. And I have already mentioned above the “truth in advertising” movement, which was a pathetic effort, dating back to the 1920s, for the industry to regulate itself. All of these have been temporary palliatives, soon killed by the capitalist political process. The Citizens United case was the coup de grace, allowing unlimited political spending by nonhuman entities of unimaginable degrees of wealth. Control advertising on the Internet. “The area of greatest concern,” say the authors, is the way that Google collects information on all its users’ viewing habits—perhaps the greatest data collection on all of us anywhere on Earth—and then sells that information to advertisers, to help them target and profile their potential customers. The possibility also exists, of course, that this data could be summoned by governments or hackers. Google defends this practice,” say the authors, “on the basis that it makes for better targeted adverts—you get a better service because you are more likely to get the adverts you want to see…. The second line of argument is that ‘free content’ has to be paid for, so why not put up with a few adverts? However, both of these arguments only tell us the content is notfree.” We pay for it with our personal privacy. End the commercialization of childhood. We briefly discussed this problem above, describing what happened to an earnest effort to regulate ads promoting harmful sugary cereals and high-fat-content foods aimed at the minds of our most vulnerable population. Though this very modest U.S. effort was killed, far more blanket regulatory restrictions against ads directed at young children remain popular in Scandinavian countries, especially Sweden. Tax advertising. The social and environmental costs of advertising must now be seen as another corporate “externality.” Businesses cause real harm through various pollutions to the community or to the environment but don’t get stuck with the cleanup costs. The taxpayers get stuck. Advertising should be recognized as causing “mental pollution” and taxed on its volume. Require ad agencies to put their name on their ads. Perhaps this would help “out” the people who are sending inappropriate messages. Perhaps their photos should also run in the corner at the bottom. Introduce statutory regulation of the ad industry. The authors point out that, at the moment, in the United States, there is essentially no regulation on advertising, other than media outlets’ discretion. Well, if an ad ran saying to go assassinate someone, probably very few media outlets would run it, and there could be a case brought for inciting murder or mayhem. But there is no longer any process to review lies in ordinary ads, or seriously misleading innuendos or statements, especially in political advertising, where it is rampant. This is clearly a very serious cause of misunderstanding of reality that has left the public in the dark about many important challenges. It is a direct challenge to the workability of democracy. Among the above, numbers 2, 3, 4, and 7 are my favorites, though I might add a couple of my own suggestions: no advertising at all should be permitted in political campaigns—only a fixed amount of free television time for each candidate. No advertising of any kind on television. No selling of consumer information by Internet companies. And the establishment of a public board to judge lying and deliberately misleading statements in advertising—with fines and bans to follow. Actually, I would also be okay with dropping advertising entirely, save for small classified-type ads in print media or on the Internet, listing commodities and services that may be available in specific categories. Some from businesses, others from individuals—a Craigslist kind of thing. But are such reforms achievable? Certainly not judging by the history and fate of far less profound efforts at reform over the last half century, at least in the United States. The entire corporate community would oppose them, as would the mainstream political community and, of course, the media itself, left to right. They would see any of these as a direct threat to capitalist “free” markets. Advertising is a crucial component of the capitalist economy, to keep itself functional and growing. Without it, and other marketing efforts that keep society addicted to visions of consumer culture and its joys, the economy would be far worse than it already is. So I am not optimistic that the above reforms can be achieved, though it is certainly worth the effort. Perhaps it’s time for something even more awakening. How about Occupy Madison Avenue? Or Re-occupy Our Minds?